A total lunar eclipse will take place on Sunday night from Europe and Africa, across the Atlantic to the Americas and eastern Pacific, as the moon passes through the Earth's shadow. The eclipse will also coincide with the moon's closest approach to Earth on its elliptical orbit (perigee). Coined the 'supermoon', the moon can appear up to 14% bigger and 30% brighter than its counterpart, the 'micromoon' (where the moon is at its furthest point away from the Earth on its orbit, called the apogee). The eclipse in the U.K. will be fully visible (weather-permitting) and will occur during the early hours of Monday morning, the entirety of the event beginning at 01:11 BST in the southern sky and ending at 06:22 BST above the western horizon. The partial eclipse will commence at 02:07 BST (when the moon will begin to turn red), leading to the total eclipse from 03:11 BST to 04:23 BST (during which the moon will appear completely red, for a duration of 1 hour 12 minutes). The moon will reach maximum eclipse at 03:47 BST. 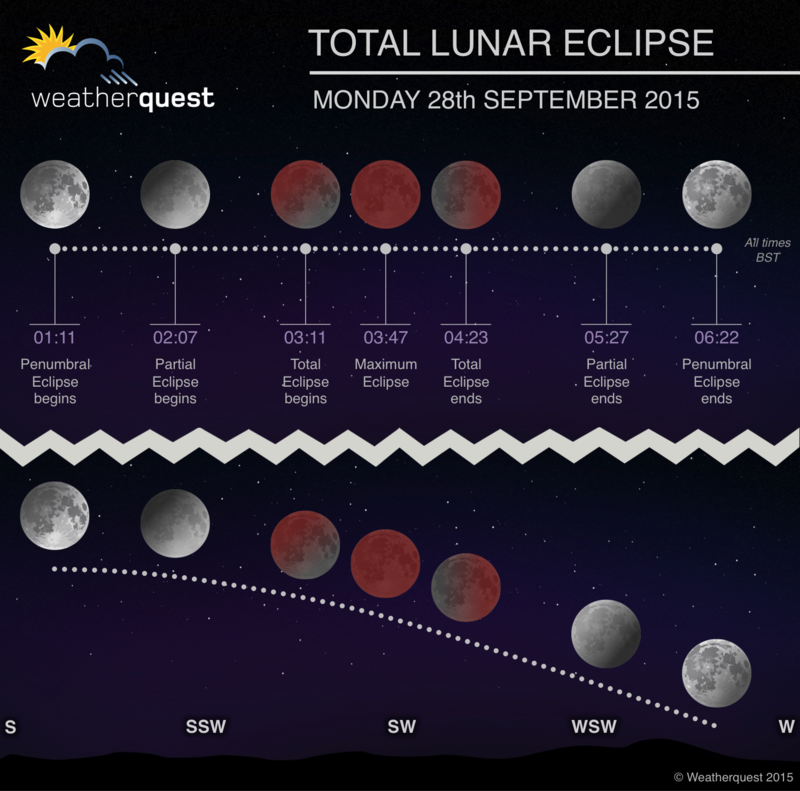 The above graphic highlights the key points of the eclipse, and time of occurrence, plus gives an indication of where in the night sky to be looking to catch a glimpse of the moon throughout the event. With high pressure across the British Isles, centred over the North Sea, we remain optimistic some parts of the country will see it, although it is too early to speculate where the best clear spells may be. Supermoon lunar eclipses are quite rare - the most recent one occurred in 1982, and the next will be in 2033. The next total lunar eclipse in the U.K. will be in July 2018, but the beginning of this event will occur before moonrise.